Energy markets posted consecutive increases in the second week of July to see the highest levels in more than a year. The main driver behind the rising crude oil prices were cited as concerns about political unrest in Egypt while firmer equity markets, lower expected oil inventories and expanded manufacturing in the US added to the gains. 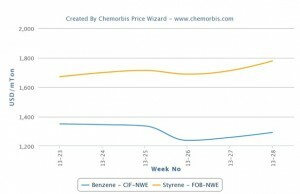 Spot styrene prices followed suit both in Europe and Asia in response to rising crude oil prices whereas spot benzene prices moved south in both regions, as per the pricing service of ChemOrbis. Although styrene prices softened and benzene costs extended their losses over this week due to thin buying interest and eased availability in some areas, styrene values still represent significant increases with respect to the beginning of this month. On the NYMEX, crude oil futures for August deliveries spiked more than $8/barrel from the beginning of July to see a level above $106/barrel and narrowed the gap between them and Brent crude prices. Brent crude futures simultaneously surged more than $5/barrel since the month started. After the relentless gains for both, energy prices have mostly held steady on a week over week basis. 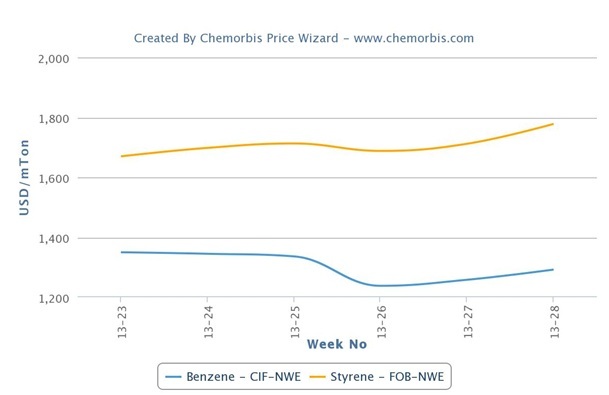 In Europe, spot benzene prices fell $60/ton on CIF NWE basis on a weekly basis, while they also indicate a $30/ton drop from July 1, as per ChemOrbis. The latest figures indicated a larger decrease of $135/ton with respect to mid-June. Although spot styrene prices decreased $50/ton on FOB NWE basis during this week, they remain $60/ton above early July levels and $25/ton above a month ago. The force majeure news from Shell Chemical contributed to the firming trend for styrene as the company halted operations at their plant in Moerdijk, the Netherlands in earlier July given technical problems. The plant normally produces 450,000 tons/year of styrene. Meanwhile, Styron Europe resumed their production in Bohlen, Germany by mid-July following a scheduled maintenance that started in early June at their 300,000 tons/year styrene plant. The restart news led supply concerns to ease recently and brought the latest weekly softening in styrene costs.